Opel Eye uses a camera at the top of the windscreen to monitor the area in front of the vehicle. Information from the camera is continuously analysed to identify road markings and traffic signs. Road markings are used as the basis of the first of Opel Eye’s two functions: lane departure warning. Traffic signs are recognised and indicated to the driver in the second function: traffic sign memory. Euro NCAP has assessed and rewarded Opel Eye on the basis of its lane departure warning function. At speeds above 60km/h, Opel Eye warns the driver if the car is about to veer inadvertently out of the lane in which it is travelling. The system can detect road markings and, if they are sufficiently distinct, unmarked road edges. The warning signal and a blinking icon on the instrument panel are suppressed if the system detects that the driver is intentionally leaving the lane: the driver’s use of the direction indicators, steering, brakes and accelerator are used to determine whether the lane departure is deliberate or not. If Opel Eye is not able to detect a lane, the driver is warned that the system is not able to assist. Opel Eye is a technology designed to prevent unintentional lane departures on regular roads. The system operates at speeds above 60km/h and is aimed at preventing severe accidents on rural roads, where lane departure would put the car in the path of oncoming traffic or off the road, and on highways, where collision with roadside objects is likely. In fact, more accidents occur between 60 and 80km/h than at higher speeds so Opel Eye is likely to provide greatest benefit on rural roads. It is estimated that if every car in Europe were equipped with a system like Opel Eye, more than 5,000 lives could be saved each year and nearly 20,000 serious injuries avoided. Opel Eye does not come on by default at the start of each journey. Though the driver can decide to leave the system on all the time, the system can be switched off by the driver and will remain off until it is turned back on again. 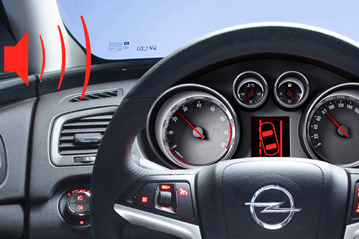 Opel Eye operates only at speeds above 60km/h. At lower speeds, such as when driving in town, the system would detect many situations where a warning would be unnecessary and irritate the driver. Poor conditions (snow, fog, heavy rain) can limit the visibility of the lanes. Opel carried out two main types of testing during the development of Opel Eye’s lane departure warning: track testing established whether or not the system could detect road markings and could issue a warning when the car was at a critical distance from the line; and road testing was used to establish the proportion of time in real-life driving where road markings were sufficiently distinct for the system to operate. For track tests, Opel used a combination of its own methodology and those prescribed in international standards. Cars were driven at different speeds and allowed to drift gently towards a road marking. The point at which the warning was issued was measured in each test. Nearly 40,000km was driven on roads throughout Europe and video was recorded. This video material was analysed to establish the proportion of time that lane markings were sufficiently distinct for Opel Eye to assist the driver.